Which Way from Newton Aycliffe? Following up on Tuesday’s post about a route from Newton Aycliffe, two Campaign members have checked the various options. Tuesday was a miserable day, intermittent rain, cloudy and cold, but even so we set out to Patches lane to see whether that was a viable option. Basically – no chance. This former railway line should not be designated as anything but a bridleway, with mud up to the hubs at numerous places. Apparently, this is the case all year, apart from a few days at the height of summer. Tim advised that the bridleways to the east of the A167 were in a similar state, so we declined the chance to try these. Instead we had a look at the A167 itself. Interestingly, there is a shared cycle/foot path on the Newton Aycliffe side of the motorway roundabout (southern side of road). The crossing of motorway-leaving or bound traffic is not as onerous as it might be. We then hit the footpath on the Darlington side of the motorway featured in the video. This is officially designated “walk your bike”, but we believe that this could easily, and justifiably, be upgraded to a shared-use cycle/foot path. Bear in mind that, until Harrowgate Hill, this is a rural area. We didn’t encounter a single pedestrian all the time we were filming this route. And we even came across some expensively paved parking space as we approached Darlington. Whose money financed THAT folly, I wonder? Surely, if there was ever a case for a shared path, this is it. Issue will be raised with the local authority imminently. 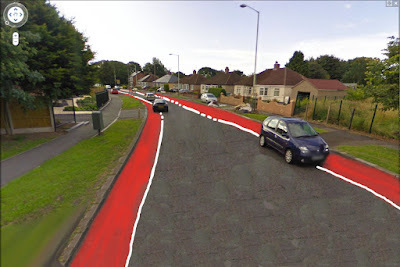 The Cycling Campaign this week received a query from a resident of Newton Aycliffe, asking about a “safe and pleasant” cycle route for families to use between the two towns. As this straddles two local authority areas, this is something that they would have to tackle through cooperation. But always wanting to short circuit such difficulties, we have decided to look at the problem ourselves. 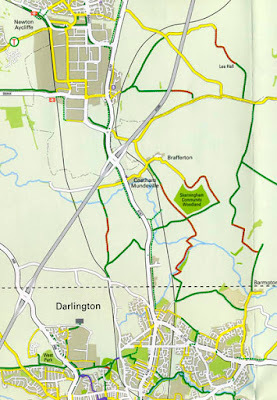 Above is the section of the Darlington Cycle Route map concerned – green routes are labelled “traffic free path”, brown “rough bridleway”. 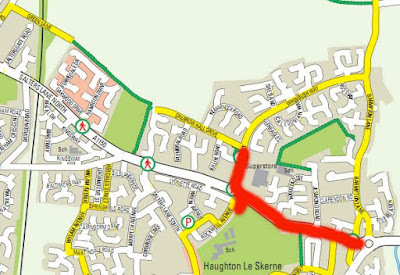 The dotted green lines along the A167 from the motorway to the White Horse in Harrowgate Hill signify “walk your bike”, an interesting concept for a cycle route map. The Campaign will be sending out two members shortly to rekki the area. Reports to follow. Meanwhile, any on the ground experience from cyclists would be welcome on this blog. There are two pieces in today’s Northern Echo where residents of Darlington are calling for traffic calming and/or a reduced speed limit. In today’s Northern Echo is a letter representing the views of residents of Eastmount Road, Darlington, calling for traffic calming. (The letter is from a Hurworth resident, which is why the Echo have incorrectly added Hurworth to the letter.) Having been in contact with the letter writer, I understand that residents would be supportive of a 20mph speed limit being introduced on Eastmount Road. OVER many months, friends living on Eastmount Road have expressed concerns over the volume and speed of traffic using this road. They have suffered a number of incidents involving damage to property and vehicles. The extent of the danger was tragically illustrated by a fatal accident on this road in early December. Therefore, on their behalf, I contacted Councillor Nick Wallis, Darlington Borough Council’s cabinet member for transport, to pass on their concerns in the hope that traffic-calming measures may be considered for the area. 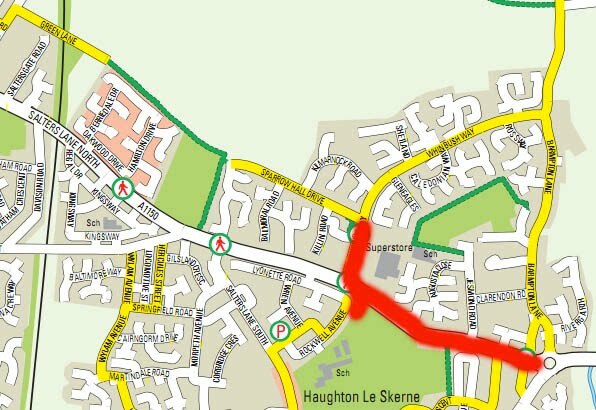 This road is potentially a key link for cyclists as it connects both Haughton Road and North Road to Valley Street from which the town centre will soon be accessible without needing to ride on the ring road. 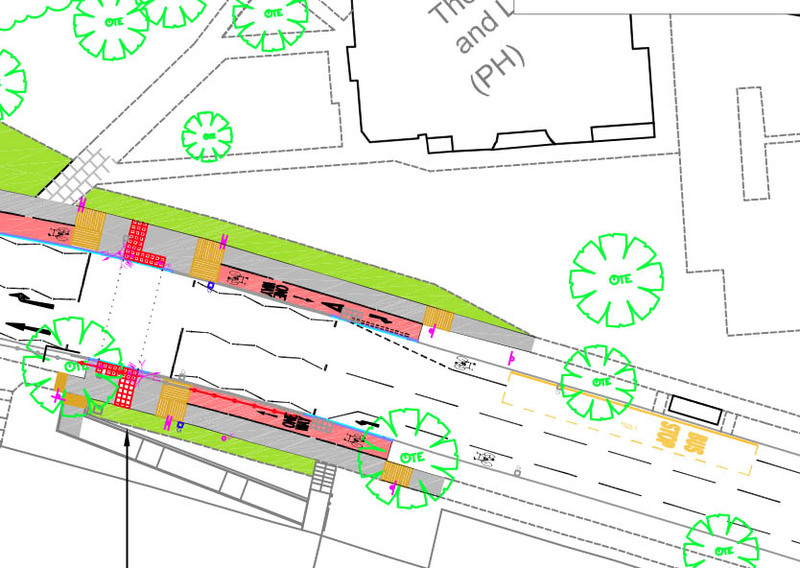 It may also link with the Riverside Path, if this is extended past Magnet. In view of the fatalities and damage to property on a residential street, its proximity to a play area, and its importance to the town’s cycle network, it seems clear to me that Eastmount Road/John Street is a prime candidate for traffic calming and a reduced speed limit.